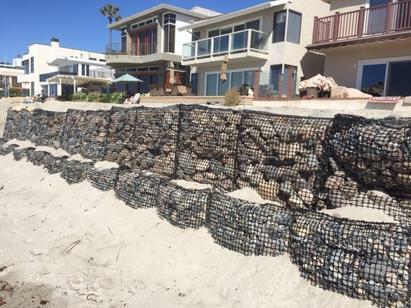 "DURA-GUARD™ GABIONS LAST A LIFETIME IN SALT WATER"
DURA-GUARD™ MARINE GABIONS ARE CONSTRUCTED OF DURABLE, NON-CORROSIVE AND ENVIRONMENTALLY FRIENDLY CO-POLYMER GEO-GRID PANELS. GEO-GRID PANELS ARE EXTENSIVELY USED IN THE CONSTRUCTION OF RETAINING WALLS, BRIDGE ABUTMENTS, ROADWAYS AND SOIL STABILIZATION APPLICATIONS. 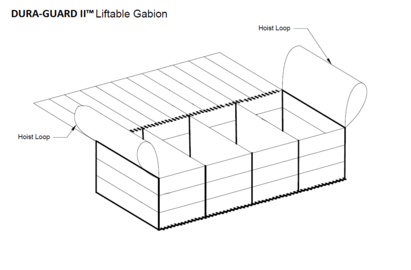 DURA-GUARD™ GABIONS ARE AVAILABLE IN SQUARE, RECTANGULAR, WEDGE OR BARREL SHAPED UNITS. DURA-GUARD™ MARINE MATTRESSES are available in various styles and thicknesses to meet specific project requirements and provide a durable, non-corrosive solution to many coastal and inland waterway erosion problems.DURA-GUARD™ MARINE MATTRESSES are available in various styles and thicknesses to meet specific project requirements and provide a durable, non-corrosive solution to many coastal and inland waterway erosion problems. 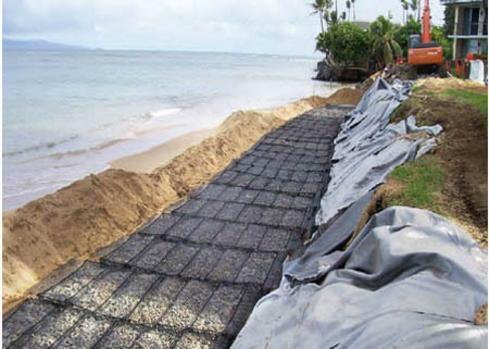 DURA-GUARD™ Marine Cells are circular gabions constructed of high strength co-polymer panels that can be filled with durable materials such as rocks, broken concrete, oyster shells, etc. Lining them with geo-textile fabric or inserting bulk poly bags enables filling with sand or other fine-grained materials.These cells can be filled rapidly, thus reducing de-watering time and saving labor hours. DURA-GUARD™ Marine Cells can dissipate wave/tidal energy, increase bearing capacity and load distribution. Applications include: Sea walls, bulkheads (new and rebuilds), check dams, breakwater cores, jetties and dikes, foundations and containment dikes for dredge spoils or other waste materials. 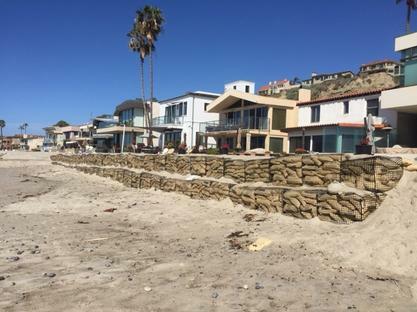 DURA-GUARD™ gabions are relatively low in cost and due to their flexible and porous construction they are able to absorb wave and wind energy, thereby reducing the scour problems associated with rigid sea defenses such as concrete seawalls. 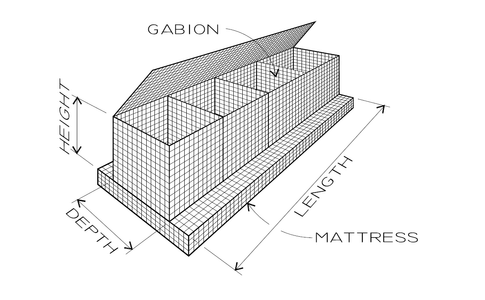 DURA-GUARD™ gabions can be placed as sloping “mattresses” or as as a base for near vertical walls constructed of stacked courses of gabion baskets. 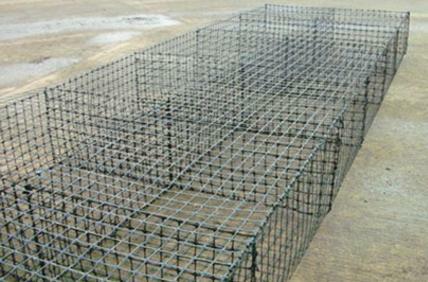 DURA-GUARD™ marine gabions are durable and more economical than type 316L stainless steel. They are resistant to salt water corrosion and all naturally occurring forms of chemical, biological and environmental degradation. 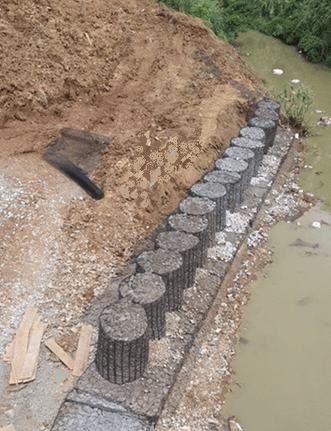 DURA-GUARD™ gabions provide increased hydraulic performance and construction advantages ... also more economical than conventional solutions such as riprap and stainless steel. They also conform to land contours and site configurations while resisting scour far better than ridgid systems. Because the co-polymer grids resist all naturally occurring forms of chemical, biological and environmental degradation, they are often specified for salt water, industrial run-off conditions and contaminated sediment capping where other types of materials would deteriorate rapidly. We offer quality American made gabions, geo materials and construction equipment to a wide range of customers including: State DOT Agencies, Cities, US Forest Service, Contractors, Builders, Landscape Designers & Architects, Excavators, Farmers, Do-It-Yourselfers and more. © 2019, BlueStone Supply LLC. All Rights Reserved.